Winner Brooks Koepka with the trophy at the 2018 PGA Championship. 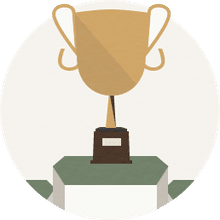 Brooks Koepka needed a tournament-record score at the 2018 PGA Championship to hold off Tiger Woods in the final round and win the Wanamaker Trophy. He got it, and with it Koepka earned several other distinctions worth noting. At age 28, Koepka became just the fifth American golfer younger than thirty since World War II to win a third major championship (joining Jack Nicklaus, Tom Watson, Woods and Jordan Spieth). 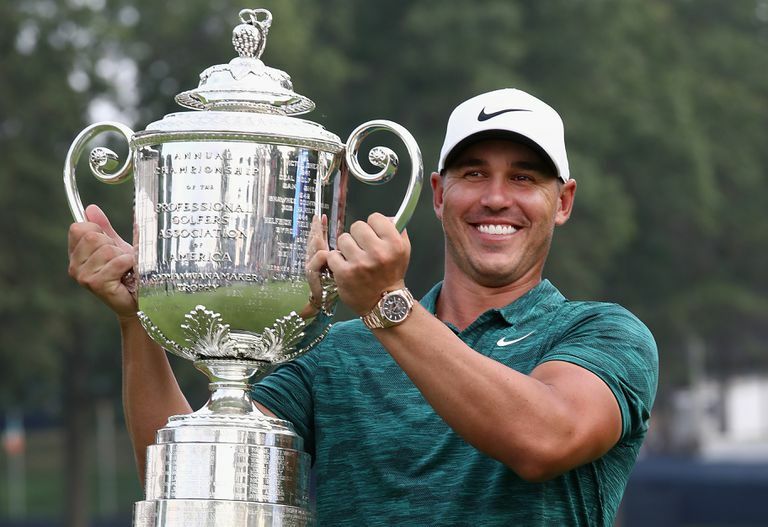 And having already won the U.S. Open in 2018, Koepka became just the fifth golfer ever to win the U.S. Open and PGA Championship in the same calendar year (joining Gene Sarazen, Ben Hogan, Nicklaus and Woods). Woods was trying to win his first major title since 2008, and did almost everything any of his fans could have hoped in the final round: Woods shot 6-under 64 in Round 4. When he birdied the final hole of the tournament, Woods posted the 14-under total score of 266, three strokes lower than Woods had ever finished in a major before. But it wasn't enough, thanks to Koepka. Koepka, who in the second round tied the PGA Championship's 18-hole scoring record of 63, shot 66 in the final round. He birdied No. 15 and 16, the parred out to win by two strokes. Koepka's 264 total established a new PGA Championship scoring record, and it also tied the lowest score ever posted in any of the four major championships.